Backyard Baseball 2001 is a sports video game released by Humongous Entertainment in 2000. 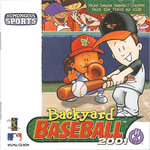 It is the second game in the Backyard Baseball series and the first to include pro kids, such as Alex Rodriguez, Mo Vaughn, Ken Griffey Jr., Jason Giambi, and many others. The game is targeted at young children. Hall of Famer Cal Ripken Jr. is on the cover. The game consists of two types of game modes: The Pickup game, where the player picks the field, the team, and takes turn picking players with the computer. When everything is set, a single match is played. The stats of the players during a single game does not affect their stats for a season. For the season mode, the player picks a team, home field, and all their players and then plays through a 14 game season, complete with a Backyard Playoffs and a Backyard World Series. The game is a single mouse played game that uses a click for swinging, throwing, and pitching. For the virtual players, each player has his own player bio with all of that player's info and personality. The bio also includes that players abilities and stats. A third type of play is also available, the online play. Backyard Baseball 2001 and Backyard Football are the only two games ever released by Humongous Entertainment and Humongous Inc. to offer online play. The online play option is shown in the middle of the treehouse, however is only available for Windows users, at that time Humongous did not support Macintosh Network systems. Source: Wikipedia, "Backyard Baseball 2001", available under the CC-BY-SA License.